Nagios is a popular open source system, network, and infrastructure monitoring application. Nagios offers monitoring and alerting services for servers, switches, applications, and services. This article will take you through the steps of building Nagios 4.0.2 from source code on an Oracle Solaris 11 system, creating an Oracle Solaris Service Management Facility manifest for the Nagios service, and creating an Oracle Solaris 11 Image Packaging System package that can be installed using a single Oracle Solaris 11 command on any system running Oracle Solaris 11. Note: It does not matter if the system is x64- or SPARC-based, and the procedures should work with all versions of Oracle Solaris 11 (for example, Oracle Solaris 11 and Oracle Solaris 11.1). Familiarity with administering Oracle Solaris 11 systems, including using the Image Packaging System, is an advantage. This article is divided into a number of different sections that cover many of the basic administration tasks. Each main section is independent of the others. You can build Nagios Core using either the GNU compiler or Oracle Solaris Studio. This article describes both way of doing it, so you can choose one of them to build Nagios Core. Before we start building Nagios, we need to install some required packages and finish some preparation for the building process. We will use a compiler to quickly install Nagios into a PROTO area. A PROTO area is essentially an isolated location in the file system that allows you to easily collect the executables, libraries, documentation, and any other accompanying files into a package. Please download the latest stable release of Nagios Core. In this article, we will use version 4.0.2. Now choose one of the following ways to compile and build Nagios Core—using Oracle Solaris Studio OR using the GNU compiler (gcc)—and use the corresponding procedure below. The Nagios configuration file will automatically detect which compiler you are using. If you have gcc already installed in your system, use that method. If Oracle Solaris Studio is not installed on your system, you need to install it now. 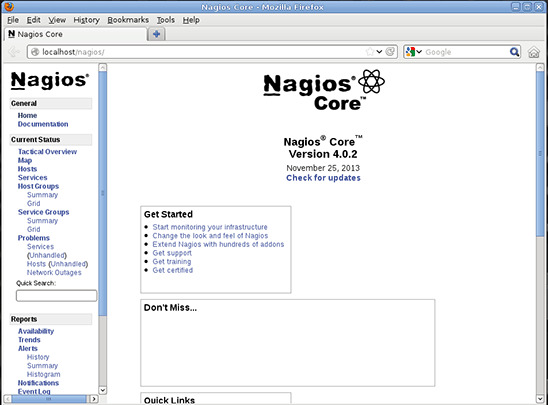 Now that all the required packages have been installed, we can build Nagios version 4.0.2 of Nagios Core. Nagios Core uses the standard configure command to check its environment, so run the command, as shown in Listing 1.
Review the options shown in Listing 1 for accuracy. Before we can compile Nagios, there are a couple of source file changes that need to be made since this version of Nagios defines a structure (struct comment) that conflicts with a system structure of the same name in /usr/include/sys/pwd.h. Perform the following steps to fix this issue. Once everything has compiled, use the make install, make install-commandmode, and make install-config targets to install the compiled binaries and sample configuration into our PROTO area using the DESTDIR command-line substitution, as shown in Listing 2. In order for this to be successfully completed, we need to first create the nagios user and nagios group. Use the useradd and groupadd commands to quickly do this, as shown in Listing 2. Nagios can also be built using the GNU C compiler (gcc). If gcc is not installed on you system, install it now, as shown in Listing 3. With the all the required packages installed, we can now build Nagios. We are working with version 4.0.2 of Nagios. Nagios uses the standard configure command to check its environment, so run the command, as shown in Listing 4.
Review the options shown in Listing 4 for accuracy. Before we can start compiling Nagios, there are a couple of source file changes that need to be made, since this version of Nagios defines a structure (struct comment) that conflicts with a system structure of the same name in /usr/include/sys/pwd.h. Perform the following steps to fix this issue. Once everything has compiled, use the gmake install, gmake install-commandmode, and gmake install-config targets to install the compiled binaries and sample configuration into our PROTO area using the DESTDIR command-line substitution, as shown in Listing 5. In order for this to be successfully completed, we need to first create the nagios user and nagios group. Use the useradd(1M) and groupadd(1M) commands to quickly do this, as shown in Listing 5. The next step is to build the Nagios plugins in our /root/PROTO area. You may choose to create a separate package for the plugins, but for simplicity, we will create a single package that has Nagios Core and the plugins. Service Management Facility manifests are used to describe a service, its configuration, and how it can be started, and stopped. Service Management Facility manifests are XML-based files that are usually located in /lib/svc/manifest. While we could write a Service Management Facility manifest manually, we will use the svcbundle(1M) command to generate a simple one for us. Behind each package is a package manifest that describes how the package is assembled. It contains information such as the package name, its version, package dependencies, and a list of files, directories, links, and other package contents. We will need to create a package manifest for our Nagios package as part of the publishing process to the repository. set name=pkg.summary value="GNU Zip (gzip)"
set name=pkg.description value="The GNU Zip (gzip) compression utility"
Each line defines an action—whether it's setting some metadata about the package such as a name and description, or whether it's specifying files and directories to include in the package. When we create a package manifest for the Nagios package, we'll split the manifest into three different sections. set name=pkg.summary value="Nagios monitoring utility"
set name=pkg.description value="Nagios is a host/service/network monitoring program"
Let's quickly go through the parts of this initial manifest shown in Listing 6. The set action represents a way to set package attributes such as the package version, a summary, and a description. 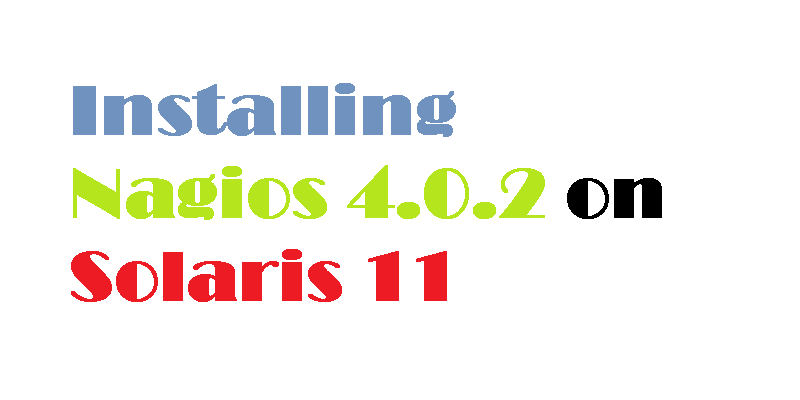 We set the package FMRI (Fault Management Resource Indicator) to nagios@4.0.2,5.11-0, which indicates we're using Nagios 4.0.2 on Oracle Solaris 11 (5.11). Variants are a feature of the Image Packaging System that allows us to package support for multiple architectures in a single package (for example, have a single package for both SPARC and x86). We set variant.arch to a variable that we will substitute in later. The nagios user, which Nagios is executing under, needs read-write access to the file we are creating by using the touch(1) command in Listing 7. We will set the file ownership and permissions in the manifest. The last transform in Listing 8 finds any file with a .xml extension within the lib/svc/manifest directory and adds an actuator to restart the system/manifest-import service when the package is installed. This registers our Nagios service description with the Service Management Facility service framework. value="Nagios is a host/service/network monitoring program"
In Listing 9, you can see that we have merged the two files. Notice that we now have a value of sparc for variant.arch. The next step is to generate package dependencies for Nagios. The Image Packaging System includes the ability to scan the contents of a package to try to detect what dependencies might exist. It does this by detecting the file type—whether the file is a script or an executable. If it's a script, the Image Packaging System will check the value of the #! statement at the beginning of the script to see whether the script is a Perl, Python, Bash, or other shell script. If the file is an executable, the Image Packaging System will look at the Executable and Linkable Format (ELF) header to see what other libraries are required for successful runtime execution. This is a two-step process, because we then need to make those file dependencies into package dependencies. In Listing 10, we can see that we have generated a number of lines that start with the depend action. If you look closely, you can see the pkg.debug.depend.file value is libc.so.1 or libsocket.so.1 (in the lines that we printed), which indicates dependencies on shared objects. We can see that all of these dependencies have been found by looking at the ELF header, and we can also see the files that have caused this dependency by looking at the pkg.debug.depend.reason value. We now have our completed final package manifest that we will use during package publication: nagios.p5m.dep.res. The next step that we will do is to take the compiled Nagios application and the package manifest and publish them to a package repository. Now that our repository has been created, let's publish our package. To do this, we use the pkgsend publish command and provide it the location of our repository, our PROTO area, and the final Image Packaging System package manifest. In Listing 11, we can see that our Nagios instance is up and running and being managed by the Service Management Facility. Start a web browser and navigate to http://localhost/nagios; you should see something similar to Figure 1. If you don't see this, check any output from the command line for errors.